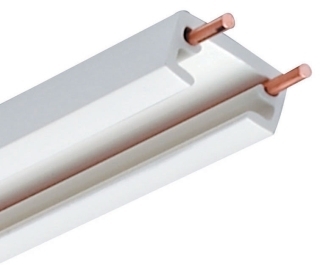 Juno Lighting Trac 12™ Collection TLV Series Ultra-miniature 1-circuit track section has a voltage rating of 12/24-Volts and current rating of 20-Amps. Surface mountable circuit track in black finish, has extruded ABS/polycarbonate construction for durability. It withstands a load capacity of 240-Watts at 12-Volts, 480-Watts at 24-Volts. This low voltage circuit track section includes end feed connector, dead end and mounting hardware. Circuit track measures 6-ft x 3/4-Inch x 3/8-Inch. It is suitable for use with TL34 conduit adapter or TL21 outlet box canopy for Class 1 installations over 60-VA. Circuit track meets UL and CSA standards.